I love quiche. I’ve seldom met a flavor combination I don’t like. We’ve already made a few from Around My French Table. The spinach-bacon was delicious. The apple-gorgonzola surprised me. This week’s selection for French Fridays with Dorie is a Mushroom and Shallot quiche, so I was excited to try it. I think I’ve mentioned before that my go-to crust is Mark Bittman’s. It works much better for me than Dorie’s, so I started with a partially baked crust made from my preferred recipe. The filling starts with finely chopped shallots sautéed in butter. 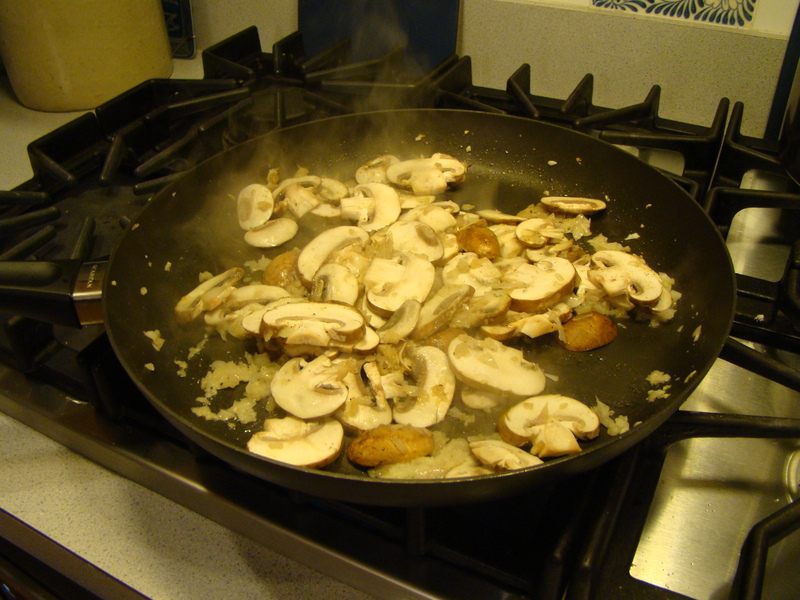 Then, I added thickly sliced mushrooms. I used cremini mushrooms, which are baby portobellos. They have a deeper, earthier flavor than button mushrooms, and they’re the closest to wild I can afford. The mushrooms developed a lovely caramelized crust as they cooked, adding another layer of flavor. Finally, I stirred some fresh thyme into the mushrooms. The kitchen smelled divine, and the mushrooms tasted the same. I could see quartering the mushrooms and making this part of the recipe as a side dish. More fresh thyme is sprinkled on the pastry crust before spreading the mushroom filling on top. A custard made from eggs and heavy cream is poured over the vegetables. Finally, sliced scallions and grated cheese top things off before baking. The recipe called for Gruyere cheese, but I picked from what I had in the cheese drawer, using a semi-soft Fontina instead. It probably wasn’t as sharp or interesting as Gruyere would have been, but it worked. Grating such a small amount also gave me a chance to use my Mouli grater. I can’t remember whether this was my mother’s or whether it was someone else’s. In either case, my mother had one just like it. She used it almost exclusively for grating chocolate for her signature chocolate chip cake. 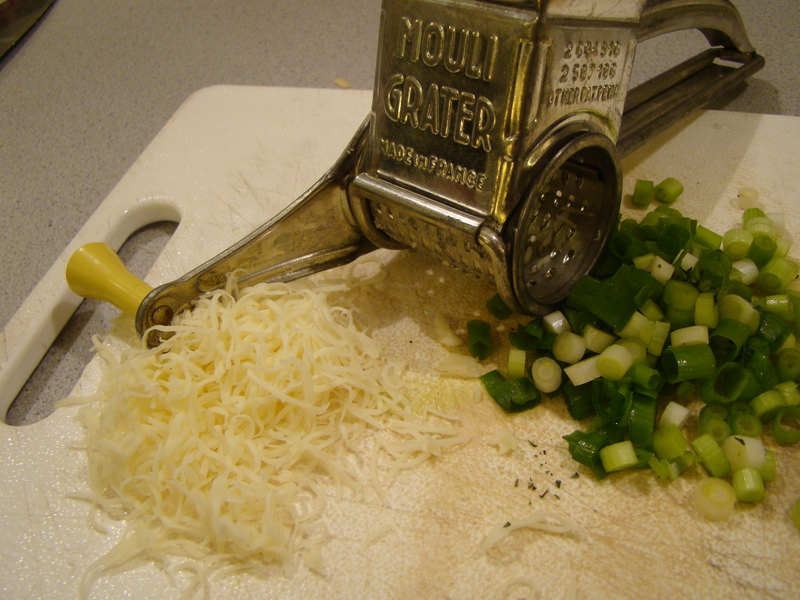 I like it for finely grating small bits of cheese. Whenever I pull it out, it also makes me smile to think of my mom. I have to say that I think this my favorite of the Dorie quiches we’ve cooked so far. I loved the mushroom filling, especially all the thyme flavor. I’m looking forward to enjoying it again for lunch later today. And, as I mentioned earlier, the mushroom preparation would make a great side dish, so it’s a two-for-one recipe, always a bonus. We don’t usually share the recipes for this cooking group, but I found Dorie’s recipe on Epicurious. 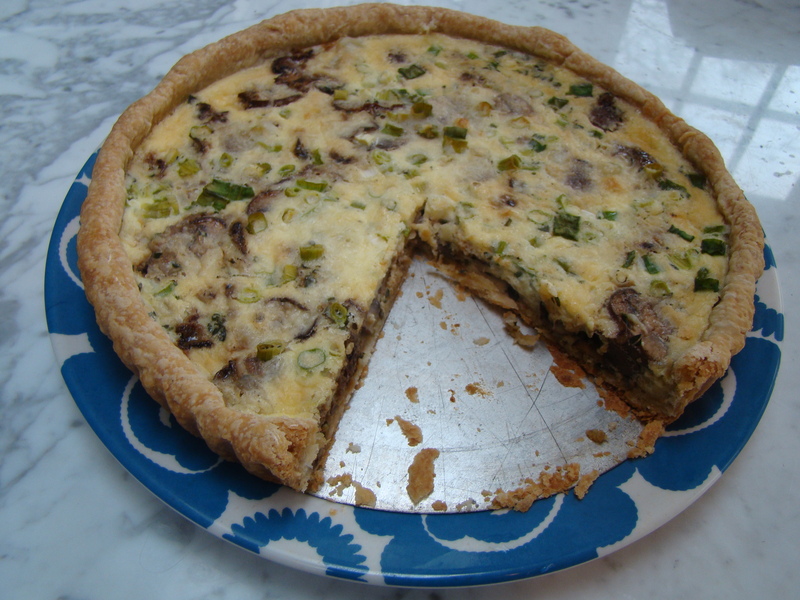 To read about the other bloggers’ quiches, follow their links, which are posted here.